Our unique crystal clear noise reducing sheets, fitted to the outside surface of existing or new roofs, take the impact of the rain, and cut the resonant frequency of roof panels to provide the same low noise levels as glass. They also extend the life of the roof, by up to twenty years, as they become the principal weather surface. 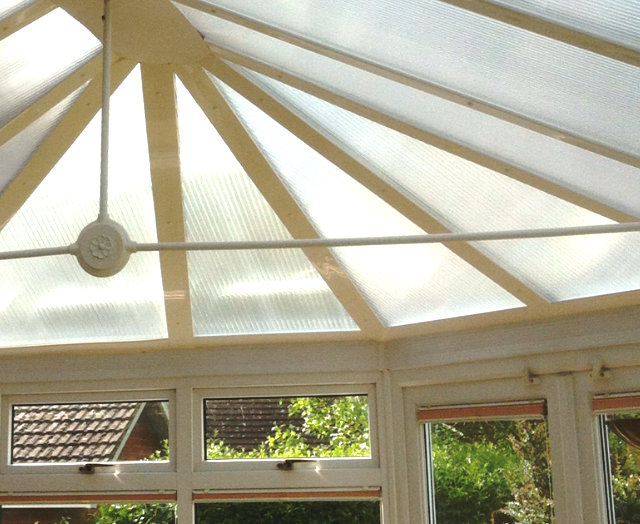 No change to the light when a Conservatory roof is fitted with crystal clear noise reducing sheets. Product demonstration video of our crystal clear noise reducing sheets’ noise reduction properties. They are also available incorporating heat reflectors to eliminate high summer temperatures, and cut glare as well as reducing noise. 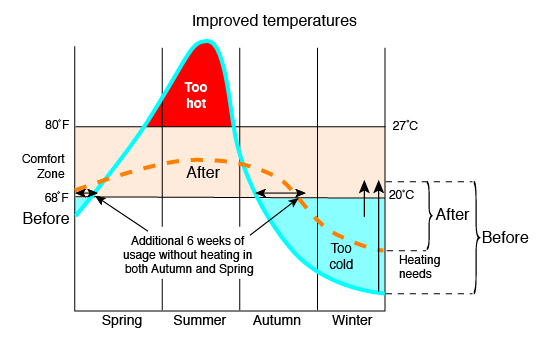 Improved temperatures in your conservatory. Polycarbonate Roofs: Performance tests for Heat reflecting sheets for solar control and noise reduction. Glass Roofs: Performance tests for Heat reflecting sheets for solar control and noise reduction. 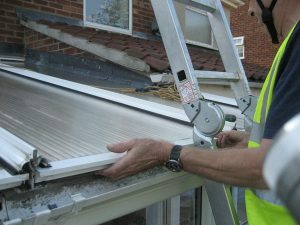 Fitting is straight forward; the glazing bar cover is removed, the heat reflective, or sound reducing sheet is fitted on-top of the glazing panel, the glazing bar cover is refitted to clamp the heat reflecting sheet in position. Installation of our Heat reflecting sheets. A One way vision grade of the heat reflecting product provides one way vision privacy and security, as well as solar control. It can be fitted directly to windows, or to reduce noise on Conservatory roofs. Why are Polycarbonate roofs noisy? Polycarbonate roof panels are manufactured by extruding melted polycarbonate at 300° C through a shaped former to make the cellular roof structure. This is cooled rapidly causing stresses at the outer surface which acts like a drum-skin when the roof is impacted by a raindrop to produces an annoying high frequency tinkling noise. HTG’s noise reducing sheets are effective because they take the impact of the rain, and modify the resonant frequency of the roof panel, reducing the sound to that of a glass roof. Because the noise reducing sheet becomes the new outer weather surface of the roof the roof’s life is extended by up to twenty years. Solar control options cut 85% of solar heat and glare for cool and comfortable summer temperatures and One way vision grades are available for safety and security.